Countermeasures are designed to increase the probability that the reentry vehicle from a threat missile reaches its intended target. BMDS testing would include the use of robust countermeasures designed to mimic those that could be used on potential threat missiles. By testing the capabilities of U.S. interceptors against realistic targets including countermeasures the ability of the U.S. to respond to an enemy missile attack would be greatly enhanced. There are two primary types of countermeasures, penetration aids or penaids and inherent countermeasures. Penaids are items that are added to the missile to increase the chance of the missile reaching its intended target. Penaids could be housed in the target reentry vehicle separation module. One penaid technique is for an offensive missile to carry, in addition to the actual target reentry vehicle, several decoy target reentry vehicles. These decoys when released, appear to be actual warheads. Inherent countermeasures are elements of normal operations of missiles that make it harder for interceptors to identify and destroy the target missile. This would include the separation of the reentry vehicle from the booster, which decreases the size of the portion of the missile to be tracked and destroyed by the interceptor. There are various basic categories of countermeasures that could be used in characterization and in testing the BMDS. These include simulation, anti-simulation, traffic maskers/obscurants, aim point denial, and maneuver. Each uses different methods to add potential threat characteristics to targets used in the Measurements Program or in other testing. Simulation countermeasures deploy various materials to confuse sensors and prevent them from correctly identifying the reentry vehicle. These countermeasures would primarily be fabricated from graphite, stainless steel, and tungsten. Anti-simulation countermeasures attempt to disguise the reentry vehicle by making the reentry vehicle look to the sensors like something other than a reentry vehicle. Traffic countermeasures deploy many items at once; this could include using multiple reentry vehicles or multiple countermeasures to confuse sensors. Maskers or obscurants are materials or objects that move in flight along with the reentry vehicle to confuse the sensors and prevent them from correctly identifying the reentry vehicle. Aim point denial is the ability to confuse the sensors from identifying the point on the reentry vehicle that should be hit to prevent the reentry vehicle from reaching its intended target. Maneuver countermeasures include the ability of reentry vehicles to change trajectory as they enter the atmosphere thus preventing the interceptor from predicting the path of the reentry vehicle. Other countermeasures are designed to increase the probability that the reentry vehicle reaches its intended target. Development of countermeasures would involve detailed planning for test events, and identifying test objectives, appropriate countermeasures and counter-countermeasures, and acquiring any necessary materials. Two types of defensive measures would be used to oppose countermeasures. The first would be improving sensor technology to more completely discriminate between the reentry vehicle and any deployed countermeasures. During the development of flight tests involving countermeasures, appropriate sensors would be selected and scheduled to participate in the test event. The second defensive measure would be improving interceptor technology to increase the chance that the interceptor can correctly identify and destroy the reentry vehicle. Development activities would include modeling and simulation as well as ground testing to characterize physical properties of countermeasures and predict behavior during flight tests. By 2001 BMDO sponsored a red team approach to the possible development of countermeasures. Operated at very modest funding levels, Countermeasures Hands-On Program (CHOP) developed and demonstrated ROW countermeasures that could be challenging for U.S. missile defense systems. By charter, CHOP did not try to develop ''sophisticated'' countermeasures. However, the unsophisticated, ROW countermeasures they do develop are realistic and challenging and should be included as an integral part of the NMD flight testing and ground test HWIL simulation programs. The CHOP program needed to be supported for aggressively examining the potential of states of concern to develop more sophisticated countermeasures. The Defense Intelligence Agency (DIA) needed to begin tracking CHOP experiments. They could then investigate and bound the ability of states of concern to develop and apply the technologies that the CHOP teams use in their experiments to counter an NMD system. This information could then be fed back to CHOP management for planning and executing CHOP developments. The 2.2 Meter balloon deployment was demonstrated in the zero-G facility at NASA Glenn Research center. The packaging scheme was that used on the IEO. The ejector and launch tube were the same as for the LREP. As with most of our inflatable targets, the optical properties can be adjusted using special coatings. The unit is debris free. The diameter, spin rate, and the coning angle can also be adjusted as well as the radar cross section. Six inflatable LREPs were flown on Talos-Sergeant-Hydac rockets. The missions were called HAVE JEEP 7A, 7B, and 7C. The rocket failed on HJ 7B. Four LREPs were ejected on the remaining flights. The technology for the Inflatable Exoatmospheric Object (IEO) was an extension of a trade study and preliminary design performed on the Exoatmospheric Decoy Program. MlT/Lincoln Laboratory contracted for the development of a balloon decoy which would be a credible exoatmospheric optical-radar replica of a Mark-12 Reentry Vehicle. 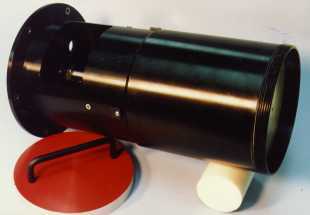 The IEO Mark 2 version was developed for the RVTO-3A program with the objective of obtaining optical and radar signatures of the IEO during midcourse and early reentry, determining if the IEO and Mark 12 surface temperatures match to within 10K, determining the reentry altitudes that the optical signatures, radar signatures, and ballistic coefficients of the IEO and the Mk-12 clearly diverge, and determining the physical survival altitude of the IEO. The IEO configuration for the RVTO-3A consisted of an inflatable bladder replicating the Mk 12 external shape, a carbon fabric outer skin for optical and radar matching, an integrated water blanket between the inflatable and the outer skin for surface temperature control, a triaxial magnetometer for determining attitude and dynamics, and a nose positioned S-band telemetry system to transmit IEO temperature, pressure, acceleration and telemetry housekeeping data. A unique Ejection Deployment Mechanism (EDM) was used to store the packaged IEO and then inflate, spin and eject it. 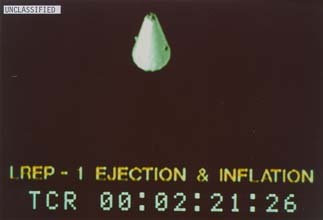 The design of the IEO and the EDM were unique because it allowed a debris-free ejection of a complex target. The IEO was flown on an Atlas F booster. The payloads, in addition to the IEO, were a Mk-12 Reentry Vehicle and calibration balloons. The Firefly is the most heavily instrumented inflatable target L'Garde has designed, tested and flown. It was built for Lincoln Laboratory's FIREFLY experiment. This was designed to test the ability of a 100 Joule LWIR laser beam for discriminating a decoy from a re-entry vehicle on the basis of decoy dynamics. The target was designed and built with different optical properties in the packaged and deployed states to aid in target acquisition and experiment, respectively. Target design and construction also accommodated observations in the L and X radar bands. The target had to eject with minimal tip-off, spin up to 3 Hz in the packaged state resulting in a 1 Hz spin rate in the deployed state through deliberate mass properties design. It went through a series of coning excursions, opening its precession angle from about 5 degrees to 20 degrees, then 40 and finally back to about 0, while conserving its initial angular momentum vector. The Firefly was instrumented to detect and change its state of motion through an on-board microprocessor and a L'Garde-developed light-weight coning control system; detect its absolute direction in space through a tri-axial magnetometer and a high-resolution sun sensor combination; keep track of all its status and housekeeping functions; and finally, process and telemeter 32 channels of data to both the bus following behind it and to the launch range below. Two successful flights above the terminator were conducted using Terrier-Malemute rockets, resulting in excellent data and the proof of principle for the Firepond Laser Radar as a useful discriminator. The MBC is intended to provide signature data on lightweight exoatmospheric traffic objects during space flight experiments. These deployed balloons will represent rapidly dispersing target subclusters to allow functional demonstration of tracking algorithms. The MBC concept is that five spherical balloons are compressed into a single canister consisting of a frangible glass tube and end caps. At the designated time, the glass franges and releases the packaged balloons. Upon release, each balloon's passive gas generator inflates the balloon, imparting a random dispersion velocity to all the balloons simultaneously. Each balloon has its own supply of inflatant and is, therefore, independent of the other balloons. Balloons were designed to meet optical and radar property requirements. The MBC includes an ejector that imparts a specified velocity to the canister and begins a timer to initiate its opening. The firing signal is provided by the bus. The overall system is designed to have no radar observable debris and only minimal optically observable debris. The MBC design is based on two other L'Garde systems - CSO and SRMP - both of which have flown successfully. 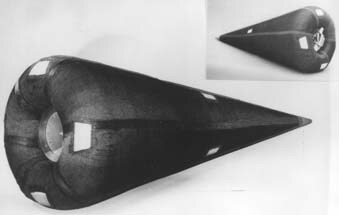 The frangible glass tube was used in the Closely Spaced Objects (CSOs) of the Red Tigress II program. This tube shatters into thousands of very small pieces, releasing its contents. 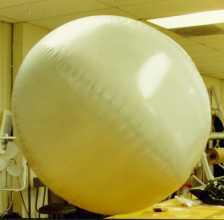 The inflation technique adapts the CSO's use of an inflatant that sublimates to generate a gas to inflate the balloon. Four CSOs flew on two Red Tigress II sounding rocket missions: two on Red Tigress IIA and two on Red Tigress IIB. The ejector closely models the LREP ejector. The LREP flew successfully on Talos-Sergeant-Hydac rockets, ejecting four LREPs on two separate missions. The diameter, shape, number, and optical properties of the inflatables can be easily tailored for different missions.